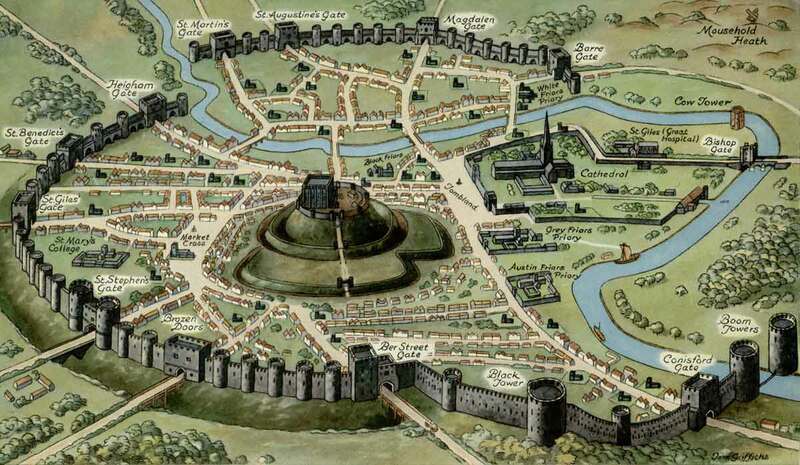 An artist's impression of the city walls and gates in the 14th century. In medieval times Norwich, already wealthy from its flourishing woollen and textile trades, had the longest system of urban defences in Britain. Built between 1249 and the mid-1300s, the walls, some seven metres in height and with a deep outer ditch, protected the city on the northern, western and southern sides. The main defence from the east was the river Wensum. Twelve fortified gates, together with twin boom towers on the river, not only defended the city at its entrances but were also used as tollgates to collect the tolls and taxes due on persons and goods passing through. In medieval times Norwich, already wealthy from its flourishing woollen and textile trades, had the longest system of urban defences in Britain. Built between 1249 and the mid-1300s, the walls, some seven metres in height and with a deep outer ditch, protected the city on the northern, western, and southern sides. The main defence from the east was the river Wensum. Twelve fortified gates, together with twin boom towers on the river, not only defended the city at its entrances but were also used as tollgates to collect the tolls and taxes due on persons and goods passing through. John Moray-Smith's 1937 bas-relief of St Stephen's Gate, on the wall of the CoachMakers' Arms public house. The main road into Norwich from London passed through the St Stephen's gate, also known at various times as the Nedeham, Nedham or Needham gate. On the wall of the Coachmakers' Arms, just a few steps from the site of the old gate, is the splendid bas-relief mural, left, created in 1937 by the Norwich artist John Moray-Smith (1889-1958). Measuring some 3m x 2.5m (10ft x 8ft 4in), it shows the gate as it was in the 1700s, and is based on a 1791 sketch by Henry Ninham, drawn just two years before the gate was demolished. The mural was cleaned and restored to its original condition by the Norwich Society in 2013. The main road into Norwich from London passed through the St Stephen's gate, also known at varous times as the Nedeham, Nedham or Needham gate. 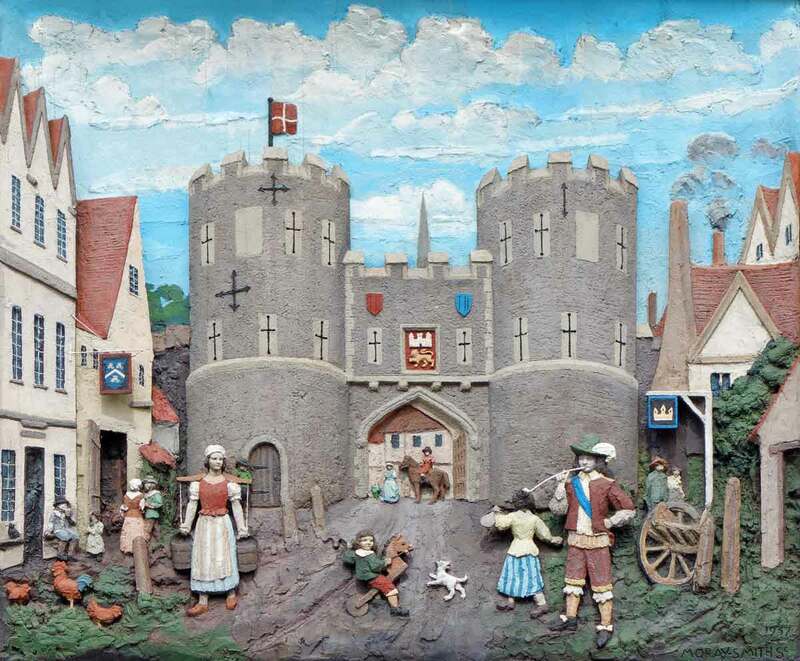 On the wall of the Coachmakers' Arms, just a few steps from the site of the old gate, is the splendid bas-relief mural, left, created in 1937 by the Norwich artist John Moray-Smith (1889-1958). Measuring some 3m x 2m (10ft x 8ft 4in), it shows the gate as it was in the 1700s, and is based on a 1791 sketch by Henry Ninham, drawn just two years before the gate was demolished. The mural was cleaned and restored to its original condition by the Norwich Society in 2013. The main road into Norwich from London passed through the St Stephen's gate, also known at various times as the Nedeham, Nedham or Needham gate. On the wall of the Coachmakers' Arms, just a few steps from the site of the old gate, is the splendid bas-relief mural, above, created in 1937 by the Norwich artist John Moray-Smith (1889-1958). Measuring some 3m x 2.5m (10ft x 8ft 4in), it shows the gate as it was in the 1700s, and is based on a 1791 sketch by Henry Ninham, drawn just two years before the gate was demolished. The mural was cleaned and restored to its original condition by the Norwich Society in 2013.